Add the corn, salt, and pepper. 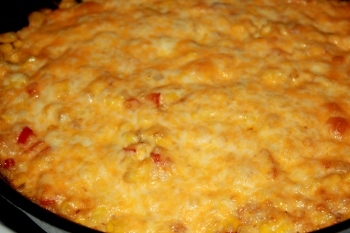 Cook for about 5 minutes, stirring occasionally, until the kernels turn deep golden brown. Transfer to a bowl. Melt the remaining tablespoon of butter in the skillet and then add the onions and bell peppers and cook for about 2-5 minutes. Add the green onions, jalapeno, and garlic. Cook until the vegetables are softened (2-5 minutes). Transfer to the bowl with the corn. Add the mayonnaise, 1/2 the monterey jack, 1/2 the cheddar and mix well. Pour into an 8-inch square baking dish (or back into the cast iron skillet). Sprinkle the remaining cheese on top. Bake until bubbly and golden brown, 10 to 12 minutes. Serve hot with your favorite gluten free tortilla chips.